Lowdown: Marines fight to retrieve Los Angeles from the clutches of aliens. Some films make it clear one has to shut their brain down prior to watching them for risk of generating fatal short circuits. Battle Los Angeles is a prime example: a silly film made [probably] using gigantic budgets and doing its best to work on its viewer at the lower levels of the human experience. In its credit, Battle Los Angeles does what it does fairly well. 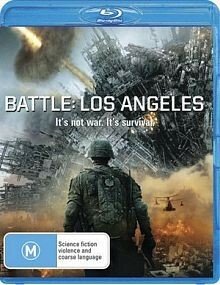 If you’re after a story then you’ll be disappointed: Battle Los Angeles’ is as basic as they come. We follow a marine sergent, Nantz (Aaron Eckhart) who has been there, done that, got his battle traumas, and is now about to retire. Lucky for him, these strange meteors falling upon the earth turn out to be nasty aliens attacking various cities across the earth. Nantz’ discharge is revoked, and his platoon is quickly scrambled under the hands of a new officer to a rescue operation in the occupied parts of Los Angeles. What follows is a series of intense infantry battle scenes between our goodie marines and the vile aliens. The latter came all the way across the stars equipped with weapons not too different to those of our marines in grade, which makes for great Modern Warfare style battles as long as the viewer is able to disregard the fact it does not make sense. Further in the not making sense department is the explanation offered for the aliens’ visit: they are here to steal our water. As if there is such shortage of water in this universe that the aliens have to wage war to get some. Let’s put it bluntly: Battle Los Angeles is a dumb film. As far as offences against the art of film making is concerned, the greatest one committed by Battle Los Angeles is its taking itself so seriously. When examined, Battle Los Angeles is not too different to other alien invasion film such as Independence Day. However, whereas the latter works by virtue of not taking itself too seriously and providing ample laughs, the former does most of its work by applying for its viewers’ patriotism. It is a very American film, with all the typical clichés one expects to find in an American action film sporting a gallant all American hero. Worst scene: Nantz spontaneously stands to attention, salutes the waving American flag, and mimes something that I suspect all flag worshipping Americans would recognize. See my above point on how Battle Los Angeles works at the lowest of levels of the human experience. Technical assessment: Battle Los Angeles is made to look like some sort of a reality show. It’s got long cuts and very – but very! – shaky handheld camera work (be warned). However, given the obviously rich nature of this production the picture on this Blu-ray is still good, and the soundtrack does very well at keeping suspense levels high over prolonged periods. Overall: An intense but yet dumb experience. I’ll go for a middle of the road score of 2.5 out of 5 stars.